Are you looking for a lovely beach home just steps away from the beach? Classic Sea Isle City beach block home in the northern end of town, just steps to the beach and Promenade. Beach side of Landis Ave with a look at the ocean! 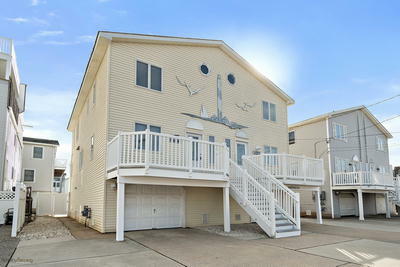 Located within walking distance to all that Sea Isle has to offer, but not right in the thick of it. Very popular area! Close to the beach, the Promenade, dinning , shopping, entertainment! This well cared for home features a bright and spacious Great Room with vaulted ceilings, skylights, and access to the east?facing main deck with ocean view!! 4 bedrooms, 2 full baths, full garage plus LOADS of off street parking, East and West decks plus a landscaped ground floor patio set in a nicely landscaped fenced yard. The total interior and exterior space allows plenty of room for the family!! Low maintenance exterior ? means you can take advantage of the location and not spend your weekends power washing or painting! Also has a great Rental History! This home is clean and PRICED TO SELL in today's market!